Buck up. Because whether you endured floods or freezing temperatures through the winter months, there’s a warm front headed this way. Presumably. Okay, you’re right, we don’t know. We’re not meteorologists. We are, however, well placed to inform you that spring/summer collections are already dropping in stores. Which means now’s the time to engage in a little forward planning to ensure you’re not left with rails of string vests and cargo shorts to pick over. Chosen for their wearability and wide appeal, these are the pieces to consider adding to your fair-weather line-up this year. Choosing and wearing patterns rarely feels easy, so it’s tempting to keep your wardrobe in a terminal state of tedium to avoid looking like a migraine-inducing mess. There’s happy news this season though because one pattern is set to rule them all: the vertical stripe. If you want to dip a tentative toe into the stripey stuff, cop a pair of side-stripe trousers, but if you want to dial things up a notch on your bottom half put your pins in pinstripes. For those ready to make a more committed pledge to menswear’s new favourite motif, a bold vertical stripe shirt will mark you out as someone who has properly swotted up on their spring/summer trends. Rules for wearing? If you’re sporting stripes up top, go big and broad, but on your bottom half go straight and narrow – pattern panic averted. More often than not, men’s sandals don’t appear to be the kind of footwear that’s consciously chosen, they just seem to involuntarily end up attached to the sock-covered trotters of every tourist who left his sense of style at home. If you’re selective with your sandals though, there’s no need to fear looking like you’re battling a bad case of the bunions. Hiking may be hot property in menswear right now, but in the case of sandals, it’s a step too far. Swerve chunky designs and velcro in favour of soft leather or suede (navy, black, brown or tan is fine) and classic metallic buckle detailing. Contrast soles, mixed material designs and asymmetric straps are all good shouts to ensure that you’re not channelling Leviticus chic. Don’t get too directional while wearing sandals either; socks and sandals is still a combo every bit as toxic as Heathcliff and Catherine. Team with tailored shorts or chinos to keep your sandals from looking scary and reap the benefit of feeling the wind between your toes. Menswear’s cycles dictate that after a while, anything that’s loved a little too much gets dropped like a hot potato. Such is the case with penny loafers, which rapidly went from Ivy League to Essex army and subsequently exited the feet of anyone serious about menswear. However, enough time has passed for old wounds to heal and these sophisticated slip-ons are now back on the soles of tasteful men everywhere. The method for choosing a pair of loafers that’ll work off duty is simple: that’s literally the rule – simple. Avoid anything that feels showy. No tassels, prints, textured weaves and, heaven forbid, embroidered logos. For styling, do as the name suggests and loaf. An easy pair of tailored trousers or chinos is a lesson in laid-back sartorialism while parked at the bottom of a pair of pinrolled jeans, your loafers will give you an easy route to the high-low dressing thing that’s king-making currency in menswear right now. Maximalism has staked its claim to the menswear vacuum left by the exit of painfully good taste, and that’s a great thing, because we were getting a bit bored, frankly. Whether it be a new take on a Hawaiian shirt or a T-shirt that can be spotted from an overhead passenger jet, a new crop of statement prints have kicked #scandicool all the way back to the Arctic Circle. Floral shirts and geometric-print tees will always fare well on your torso, while down south the best way to shout about your style is with exaggerated takes on classic menswear patterns. Blown up houndstooth and windowpane checks will make light work of transforming wall flowers into wave makers. Just make sure that you’re not overdoing your commitment to the school of maximalism: keep any item that isn’t your chosen print pared-back and relatively subdued in colour (think black, navy, grey), because nobody likes a blatant attention seeker. If you thought that what you carry all of your stuff in was simply a matter of practicality, you’re not doing menswear right. Yes you should look for maximum utility (a backpack will certainly give you that), but any old two straps and a zip number just won’t cut it now. Why settle for bog-standard gym gear when you can have something bolder? If you’re a self-confessed excitement-phobe look for a block-colour design in cobalt blue, red or racing green. On the other hand, if you’re happier to be bold AF, look for detailed geometric prints, stripes or polka dots. Just make sure that you’re not giving passers by sensory overload by teaming your bold bag with more restrained looks: commuters have got enough on their plates without having to deal with someone dressed like a kids’ TV presenter. Okay, so the bomber jacket isn’t exactly dead and buried. But recent seasons have seen designers moving things on a bit, producing styles rooted in the traditional MA-1’s shape but rendered in premium fabrics – like suede and silk – better suited to cocktail bars than airborne battles. And it’s not just bombers getting the suede treatment, but blousons too. Which means you don’t always have to default to a linen blazer when you want to look smart in warmer weather. 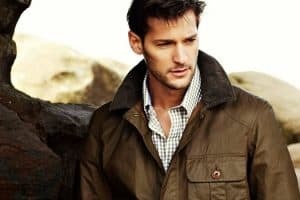 A suede jacket – whether blue, black or brown; bomber, blouson or Western – will chime just as well with an Oxford button-down shirt, provided it comes in a tailored fit and length that falls just below your waist. Don’t be put off by the fact that suede outerwear has been doing the rounds for a few seasons either: it’s here to stay. So, if you’ve thus far resisted the suede jacket’s buttery-soft charms, it’s not too late to give in to temptation and let your top layer give you all of the feels. N.B. check the weather app for clear skies before taking this one for a spin, and remember to pre-treat with a quality fabric protector as well. Now that we know short-sleeved shirts aren’t solely for suburban bank tellers, it’s never been easier to look smart without breaking a sweat. A Riviera mainstay, the Cuban collar variation – distinguished by its open, notch lapel-like collar – makes you look like the kind of man who summers in a Cap Ferrat villa, even if your budget’s more Cotswolds staycation. While colour is really a matter of personal preference, fit most definitely is not: err too tight with a Cuban collar shirt and you’ll look like you take your style cue from Pablo Escobar; err too baggy and you’re wearing what is, for all intents and purposes, a big girl’s blouse. Opt for a cut that’s trim but not so tight that it hugs your biceps or puckers at the shoulder. And if you’re looking to break from the legions of men who are – finally – adopting the Cuban collar, go for bold stripes or windowpane checks, which will bring the style firmly up to date. Oh, and never accessorise with a gold chain and chest hair. Ignoring the fact that relaxed-leg anything is golden in menswear right now (see dad denim), it goes without saying that summer isn’t the best time to squeeze yourself into a pair of skinnies. Why? Because even the sleekest of silhouettes isn’t worth drowning in puddles of your own sweat. Ditch the discomfort (and keep the streamlining effect) with a pair of chinos cut a little more laid-back. Straight-leg (or tapered if you must) chinos are arguably the single most versatile weapon in your warm-weather arsenal, styling as easily with a crew neck tee or polo as a short-sleeved shirt and lightweight jacket. Consider only breathable cotton and cotton-linen blends, and steer slightly conservative with your colour choice (stone, beige, grey, khaki and navy work well) for optimal wearability. Another season, another military-inspired jacket. While the bomber may have led the menswear charge for the past few seasons, it has a new ally this season. Stepping up to the plate is the many-pocketed field jacket, with a slew of designers offering their riff on the classic M-1965. Good news, then, if you’re a fan of warm-weather outerwear that skews smart rather than skinhead. Look for a cotton twill style in olive drab or stone if you’re steering traditional; suede, if plushness is your top priority; or get technical with one of the many lightweight nylon takes available. While you’re looking for as many pockets as you can find to capitalise on this season’s love of all things workwear, stamp out the urge to fill your pockets to udder-like capacity. Only a certain degree of utility is acceptable unless you’re actually going to war – you don’t want to ruin those nice clean lines now do you?